The Guardian report is the most viewed article on the guardian.co.uk web site in the last 24 hours, and the second most viewed in the last 7 days. 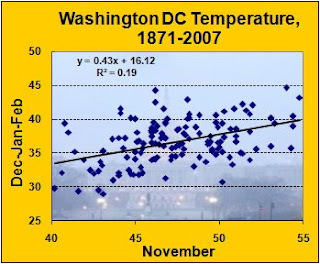 November's average temperature of 46.6° at Washington's National Airport was 2.1° below the 1971-2000 "normal". This made it the coolest November since the 46.2° in 1997, just barely beating out the 46.7° in 2000. The month was tied with 1937 as the 59th coolest November in 138 years of official records. Although the daily high of 74° on both the 1st and 15th was well above the long-term average, no daily high or low records were seriously threatened. The monthly low of 26° on the 22nd was significantly above the record low of 12° for the date. Does a relatively cold November predict a cold winter? The lower chart to the right shows the relationship between the November average temperature and the following December-January-February average since 1871. The upward sloping trend line indicates that cold Novembers tend to be associated with relatively colder winters, but the relationship is not very strong. The equation of the trend line indicates that for every 1° change in the November average, the winter average moves in the same direction by about 0.4°. On the other hand, there is a lot of scatter in the data. The "R-squared" says that only 19% of the variability of the winter average temperature is accounted for by the November average. As December Goes . . . The current cold pattern in the northeastern US should persist through at least the first half of December. A temporary transition to a mild pattern should occur from January into early February, before the pattern reverts back to a much colder regime during the last weeks of winter. 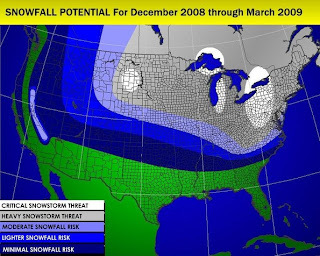 Larry Cosgrove's WEATHERAmerica is forecasting a "very wintry Midwest and Eastern Seaboard", including the "possibility of major ice storm formation around Appalachia and the Piedmont (including the markets of Birmingham AL; Atlanta GA; Charlotte NC; Raleigh NC; and Richmond VA)." Click here for previous winter outlook posts. 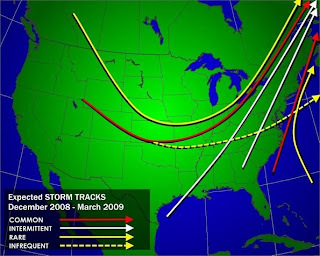 Images: Predicted storm tracks and snowfall potential for winter 2008-2009 from WEATHERAmerica. As noted in a previous post, among the records set in the 2008 hurricane season was the one for the "first time major hurricanes have been observed in five separate months". Even before this record became final, a new study analyzed the question of whether hurricane seasons are becoming longer in general. A paper describing the results of this study was recently accepted for publication in the peer-reviewed journal Geophysical Research Letters of the American Geophysical Union. 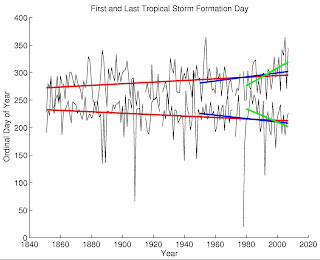 The study, by Dr. James P. Kossin of the Cooperative Institute for Meteorological Satellite Studies at the University of Wisconsin, first looked at the dates of the first storm and last storm for each season. The results showed that "the time of occurrence of the first and last annual formation events exhibit decreasing and increasing trends, respectively, suggesting that the length of the hurricane season is increasing." The chart to the right above shows a graph of the dates and trend lines. The red lines are the trends for the entire period 1851 to 2007. The blue lines cover only the period of aircraft reconnaissance data, and the green lines are for the satellite observation era. Looking at just the first and last dates doesn't say anything about shifts in the distribution within the season, however, so Kossin also used a statistical analysis technique called "quantile regression." The quantiles represent subsets within the distribution. For example, 20% of the storm formation dates occur prior to the date at the 0.2 quantile. The quantiles, shown in the charts below (click to enlarge), indicate a negative trend (earlier formation) for the beginning of the season and a positive trend (later formation) for the latter part of the season. A consistent signal emerged that suggests the season has become longer as the earliest formation dates of the season have become earlier and the latest dates have become later. While the sign of these trends remain consistent when different periods are considered, the uncertainty is sometimes high. . . . 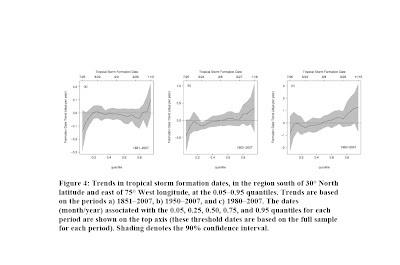 The analyses presented here show how storm formation dates have been changing within the historical hurricane record, but cannot be used to directly implicate cause for these changes or to accurately predict future changes. 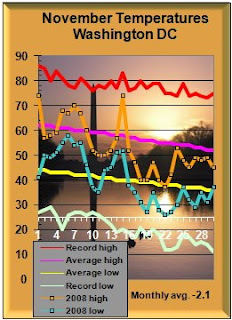 Average Noon Temperature when a Republican President is sworn in is 40.4 F.
Average Noon Temperature when a Democratic President is sworn in is 33.0 F.
NASA's Goddard Space Flight Center surveyed the history of inclement inaugural weather, also in 2001. 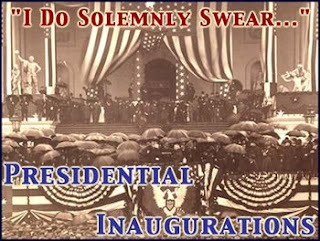 For more details on inauguration weather, see this earlier post. First time six consecutive storms made U.S. landfall (Dolly, Edouard, Fay, Gustav, Hanna, and Ike). Longest-lived July hurricane on record, longest-lived hurricane so early in the season, longest-lived tropical storm in July and so early in the season (Bertha, which was a hurricane 7.75 days, eclipsing the previous record of 7 days held by Hurricane Emily of 2005. Bertha was at tropical storm strength for 17.25 days).